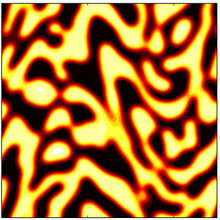 The Cahn-Hilliard equation with an externally prescribed chaotic shear flow is studied in two and three dimensions. The main goal is to compare and contrast the phase separation in two and three dimensions, using high-resolution numerical simulation as the basis for the study. The model flow is parametrized by its amplitudes (thereby admitting the possibility of anisotropy), length scales, and multiple time scales, and the outcome of the phase separation is investigated as a function of these parameters as well as the dimensionality. In this way, a parameter regime is identified wherein the phase separation and the associated coarsening phenomenon are not only arrested but in fact the concentration variance decays, thereby opening up the possibility of describing the dynamics of the concentration field using the theories of advection diffusion. This parameter regime corresponds to long flow correlation times, large flow amplitudes and small diffusivities. The onset of this hyperdiffusive regime is interpreted by introducing Batchelor length scales. A key result is that in the hyperdiffusive regime, the distribution of concentration (in particular, the frequency of extreme values of concentration) depends strongly on the dimensionality. Anisotropic scenarios are also investigated : for scenarios wherein the variance saturates (corresponding to coarsening arrest), the direction in which the domains align depends on the flow correlation time. Thus, for correlation times comparable to the inverse of the mean shear rate, the domains align in the direction of maximum flow amplitude, while for short correlation times, the domains initially align in the opposite direction. However, at very late times (after the passage of thousands of correlation times), the fate of the domains is the same regardless of correlation time, namely alignment in the direction of maximum flow amplitude. A theoretical model to explain these features is proposed. These features and the theoretical model carry over to the three-dimensional case, albeit that an extra degree of freedom pertains, such that the dynamics of the domain alignment in three dimensions warrant a more detailed consideration, also presented herein.